Starting back in 1989, Quebec black metallers Ordoxe released a demo and then vanished from sight a couple years later, resurfacing to release a number of full-lengths over the last ten years. 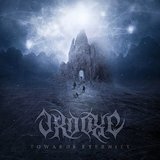 The latest, Towards Eternity (no relationship to the Old Man's Child song) is a well-produced piece of melodic black metal that smoothly melds in influences from other genres. The album's melodies prove that Ordoxe knows how to write a good tune. Grinding palm-mutes on the rhythm guitar side give the songs a jerky rhythm, with the lead guitars free to throw palm-muted solos at the listener at their leisure. Lead musician Jean-Francois Jalbert's vocals appear to be dubbed on top of each other as shrieks on top of death metal-style growling; making them difficult to understand most of the time, even if one speaks French (the language of some of the tracks). Towards Eternity is most at home on faster pieces where the aggression of the rhythm section has room to drive the cutting edge of the melody into the listener's brain, and fortunately, most of the time this happens; at time, the riffing takes on a progressive, lateral key, reminding one of something by Extol. It's not flawless; a few times, a track slackens the pace of the music, which lowers the energy and detracts from the band's atmosphere of clean but chaotic speed. Even then, dragging marches like Your Sorrow, My Sorrow come off pretty well from the treatment, though the real prize on the album remains fast headbangers like Sword of Damocles or the crunching rhythm of A Passage in Time, one of the tracks where the band gets just the right mix of black metal fury and melodic smoothness into the song. Despite its multi-genre influences, Towards Eternity doesn't push a lot of boundaries, but it's a satisfying experience for the melodic black metal fan.